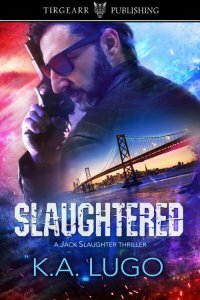 From the very start, this first book about Jack Slaughter is a page-turner. K. A. Lugo will have you rooting for Jack as he is forced to remember the past that changed everything. Shocking at times, gruesome as the body count rises. K.A. cleverly leads the reader down the path of Jack’s investigation, giving away nothing until ready to do so. A thoroughly engaging, edge of your seat thriller that rates high up there with the likes of Lee Child, James Patterson, Tess Gerritson, Sandra Brown, Karen Rose, John Grisham etc; you can see where I am going with this.